In lung cancer patients who were taking immunotherapy drugs targeting the PD-1 pathway, testing for CD8 T cell activation in their blood partially predicted whether their tumors would shrink. The results are published in PNAS. Drugs targeting PD-1 or its ligand PD-L1 re-activate "exhausted" CD8 T cells by promoting their expansion and unleashing their ability to destroy cancer cells. Researchers at Emory Vaccine Center, led by co-senior author Rafi Ahmed, PhD, have been intensively studying the cells that are revived after inhibitory signals from PD-1 are blocked. Ahmed is director of the Vaccine Center and a Georgia Research Alliance Eminent Scholar. 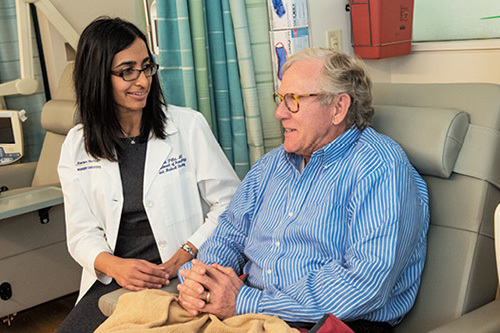 Winship investigators Rathi Pillai, MD and Suresh Ramalingam, MD, Winship's deputy director, teamed up with Alice Kamphorst, PhD and Ahmed's group to examine blood samples from 29 advanced non-small cell lung cancer patients undergoing immunotherapy treatment. The patients were being treated at Winship Cancer Institute-Emory University with drugs blocking the PD-1 pathway, known as checkpoint inhibitors (nivolumab, pembrolizumab or atezolizumab). Blood samples were obtained before starting treatment and before each new treatment cycle, which lasted two to three weeks. Most patients (70 percent) displayed an increase in the number of proliferating CD8 T cells in their blood after starting PD-1 targeted treatment -- an observable effect on the immune system. However, not all patients with an immunological response experienced a "partial clinical response", meaning that their tumors shrank by at least 30 percent. All patients with partial responses survived at least one year, while just one of seven patients with progressive disease was reported to survive one year. Survival times for three patients were not available. An early increase in activated PD-1+ CD8 T cells appears important. 80 percent of patients with clinical benefit exhibited PD-1+ CD8 T cell responses within 4 weeks of treatment initiation. 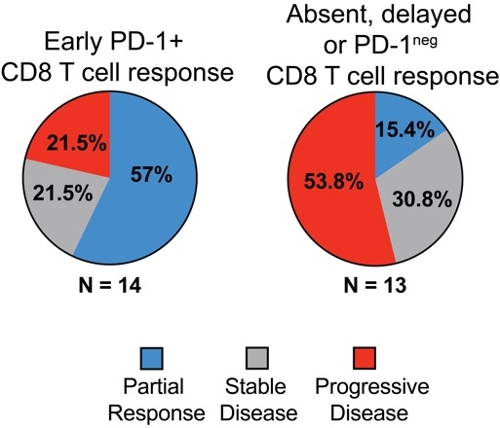 In contrast, 70 percent of patients with disease progression had either delayed or absent PD-1+ CD8 T cell responses. "We hypothesize that re-activated CD8 T cells first proliferate in the lymph nodes, then transition through the blood and migrate to the inflamed tissue," Ahmed says. "We believe some of the activated T cells in patients' blood may be on their way to the tumor." Proliferating CD8 T cells displayed high levels of PD-1, as well as other molecules that influence their activity, which may be targets for combination therapies. The Emory/Winship team recently published a paper in Science, incorporating data from this study, showing that the costimulatory molecule CD28 is required for proliferation following PD-1-targeted treatment. The study supports a straightforward idea: if CD8 T cells appear to respond to immunotherapy, that's a good sign. "Our ability to detect proliferating T cells in the blood and correlate this with clinical benefit is exciting since this captures a real-time assessment of the immune system's response to PD-1 directed therapies and is a readily accessible test from our patients' perspective," Pillai says. While looking for activated T cells in the blood is not yet predictive enough for routine clinical use, such tests could provide timely information, says co-senior author Ramalingam. Monitoring the immune response could potentially help oncologists and patients decide, within just a few weeks of starting immunotherapy drugs, whether to continue with current treatment or combine it with something else. "We are already doing larger studies to confirm these observations and extend them to other cancers beyond lung cancer," he says. This work was funded in part by the National Institutes of Health and the T. J. Martell Foundation.